I absolutely love blogging about Jewellery, but after posting about my stunning Crystal Rock Rings earlier on in the month, I realised that I haven't actually blogged about jewellery all that much over the past year or so. I think the main reason for that is I've been concentrating on other topics, but I'll be looking to change that up a little bit this year. 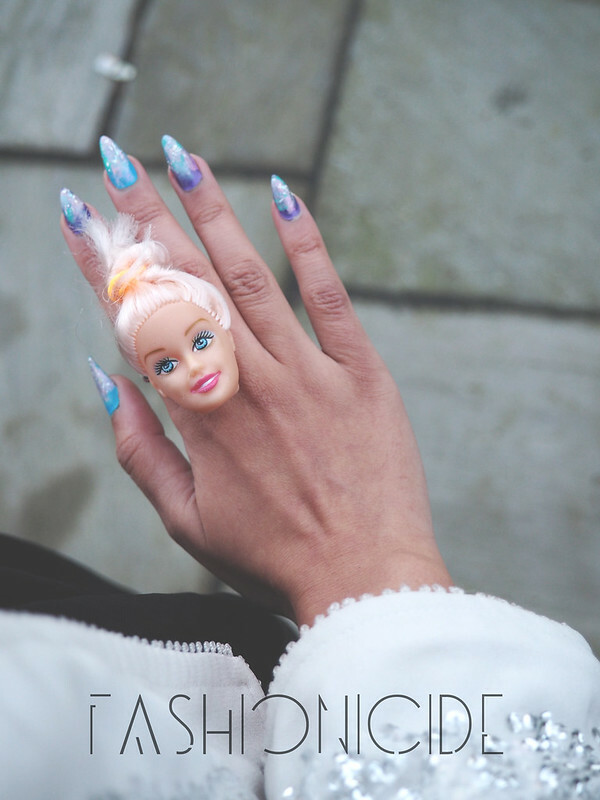 So without further ado, I present to you The Barbie Head ring! I did actually have a Barbie when I was a kid, but not one of the standard white ones, it was a brown skinned model, bought for me ironically by a white family friend. I used to take her everywhere with me, and of course she took a right beating (I was 7, give me a break!) But aside from that, I've never really given a toss about Barbie or any other kind of doll if I'm honest. 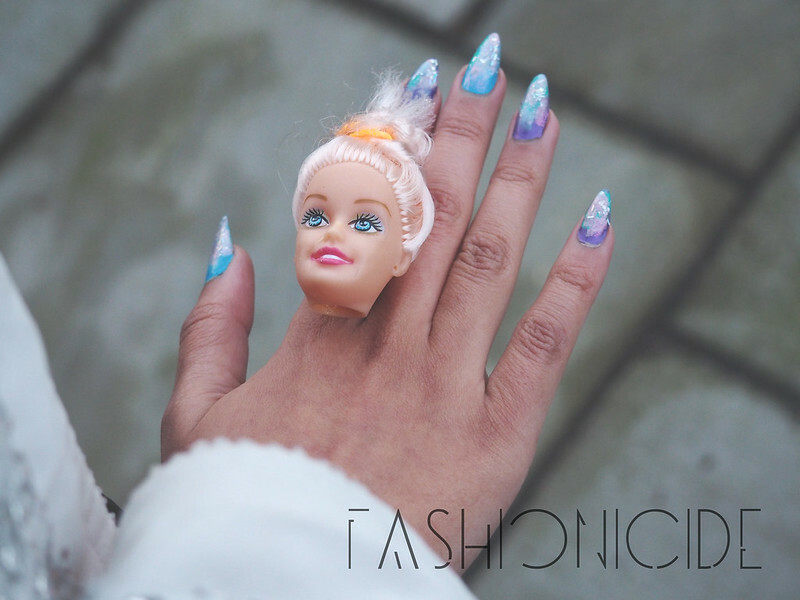 But this ring reminded me a little of Sid from Toy Story and I can just imagine a Barbie body somewhere out there in the world with an Alien head in place of her intended one! The ring itself was purchased on Depop, which I find to be like a goldmine for odd and unusual things like this, at a snip for just under £5. 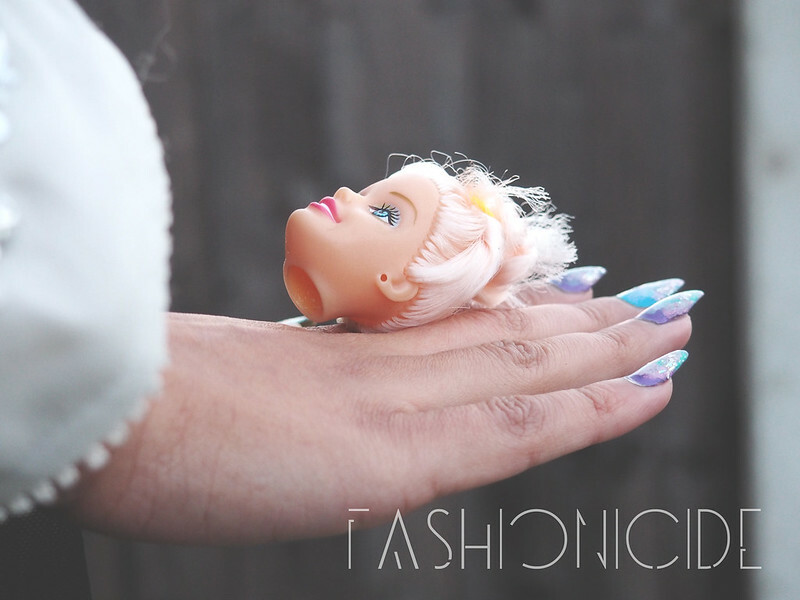 There's not really an awful lot of description needed apart from to say it's a Barbie's head attached to an adjustable ring, it's a hollow rubbery head, with soft doll-like hair. I love the look of the ring, the way it stands out from the hand and attracts all kinds of attention! There is one slight drawback is the adjustable part of the ring - what you'd usually expect from an adjustable ring is to adjust it to make it smaller to fit your finger, but this ring is so small, you have to adjust it to make it bigger! It's a weird annoyance, but given it cost just a fiver and looks positively awesome, I think I can let that slide! This is way too dope. I see decapitated and it drew me in, can I splatter blood on her come Halloween? I love this ring so much! I miss wearing fun, kitschy jewellery... I think you've inspired me to start wearing it all again, haha! This is amazing!! I'm tempted to draw a Some goth makeup on her! je vous remercie beaucoup pour vos aimables paroles ! Je me sens presque un peu désolé pour Barbie maintenant! Great ring! You just don't see enough blog posts with the word 'decapitated' in the title nowadays, haha.